Are you confused about the types of asphalt shingles? 3-Tab Asphalt Shingles - These asphalt shingles are the lightest weight, most economical, simplest in design, and are the least wind rating of all shingles. If the have a two story home or are exposed to winds on a continuous basis, these shingles may not be for you. The manufacturer usually covers the warranty up to 60 mph winds. Architectural/Laminated/Dimensional Asphalt Shingles - These asphalt shingles are medium weight, mid-range economical, provide depth of look, offer a better color selection than 3-tab asphalt shingles, and provide a solid wind rating. These shingles also provide algae growth resistance (mildew) due to additives in the shingle making process. These shingles usually provide 30 year to limited lifetime material manufacturer warranty. The manufacturer usually covers the warranty up to 110-130 mph winds. Designer Asphalt Shingles - These asphalt shingles tend to be the heaviest weight, most expensive, provide a variety of color and shapes, and provide the highest wind rating. There are a number of these shingles to choose from to give a slate, shake, tile, or unique look to your home. These shingles also provide algae growth resistance (mildew) due to additives in the shingle making process. These shingles usually provide limited lifetime material manufacturer warranty. The manufacturer usually covers the warranty up to 110-130 mph winds. 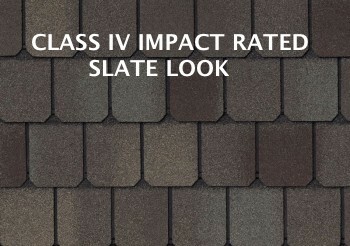 Class IV Impact Rated Modified Asphalt Shingles - These asphalt shingles specialize in providing a higher impact resistance than the other shingles. The impact resistance is provided by chemically modifying the asphalt in the shingles. These shingles also provide algae growth resistance (mildew) due to additives in the shingle making process. These shingles usually provide 50 year to limited lifetime material manufacturer warranty. The manufacturer usually covers the warranty up to 110-130 mph winds. The above description of asphalt shingles is a simplified look and designed to provide you with a quick reference for deciding on the asphalt shingle for your roof. Any of these shingles can provide advantages or disadvantages depending on your unique situation. Call Barton Roofing in Austin Texas to discuss this in more detail with a qualified roof expert.